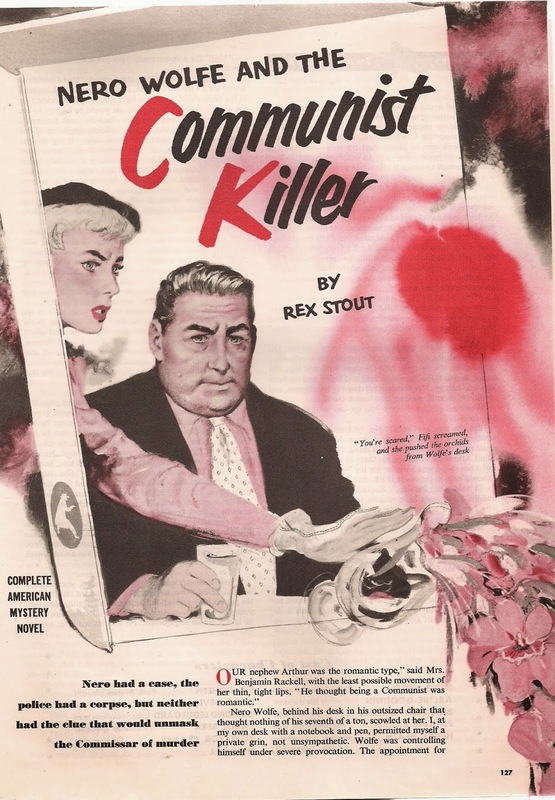 Learn about the events that led to CLJII's fascination with comic book, move serial and pulp magazine storytelling in PART I of a revealing interview conducted by Bill Mills. Then buy The Emperor books at Amazon, B&N, iTunes and other ebook sellers. Only $3.99. "When Thornton Utz . 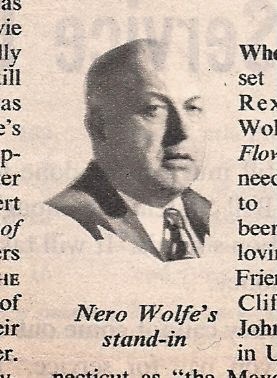 set about illustrating Rex Stout's Nero Wolfe mystery ("Omit Flowers') he needed a very big man to pose as Stout's beer-drinking, orchid-loving detective hero. Friends told him about Clifford L. "Tiny" Johnson, who is known in Utz's part of Connecticut as "the Mayor." Johnson is a 6-foot-4-inch 'mountain of a man who weighs 310 pounds and is "the mayor"i.e., First Selectman—of Fairfield Township, Conn. "Tiny" operates his own insurance agency in Fairfield, says his mayoral duties are not so arduous they would prevent him from posing for an artist, so he was delighted to stand in for Nero Wolfe. 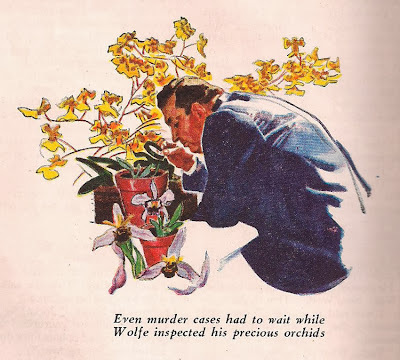 Unlike Wolfe, "Tiny" wouldn't cross the street for the rarest orchid in captivity, and, as far as he is concerned, his friends can "omit beer," too." 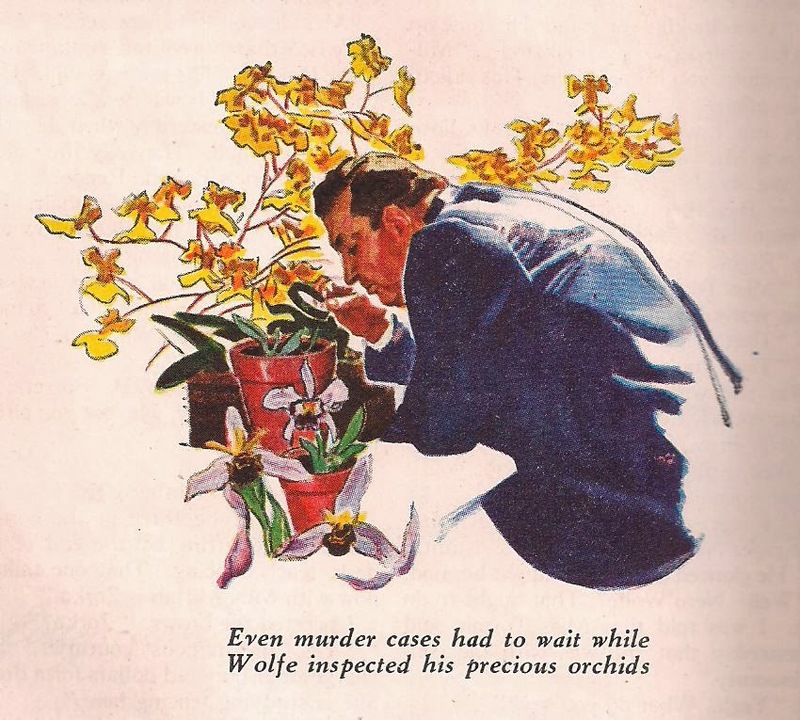 --From the American Magazine Nov. 1948. Have you met the female Nero Wolfe in the newly reprinted of the famous 1940s sleuth, Amy Brewster? If you love Wolfe, you will love Amy Brewster. 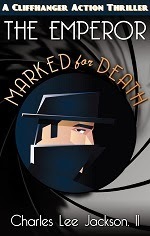 "Amy Brewster is a cigar-smoking, 300-pound lawyer-financier introduced by Sam Merwin Jr. in 1945. Upper-class but unfeminine, she is enlisted by friends to solve crimes. She appears in Knife in My Back (1945), Message from a Corpse (1945) and A Matter of Policy (1946). 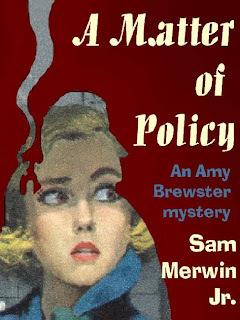 Amy Brewster is defined against the genre's stereotypes, particularly the femme fatale: she is not attractive, not home-bound, and not submissive, either conversationally or professionally." -Frances A. DellaCava and Madeline H. Engel, Female Detective in American Novels, A Bibliography and Analysis of Serialized Female Sleuths (1993). PORTRAITS OF NERO WOLFE AND DAUGHTER FROM ORIGINAL MAGAZINE PRINTING OF "OVER MY DEAD BODY"
No one was more surprised than Archie Goodwin when he learned Nero Wolfe had a long-lost daughter in the classic "Over My Dead Body." The fact that Wolfe's daughter, to get him to help her friend, told him the friend was his daughter, added to the mystery. Below is artist Carl Mueller's conception of the Wolfe and daughter. Ssee all eight full sized illustrations from this story at our Facebook Album. 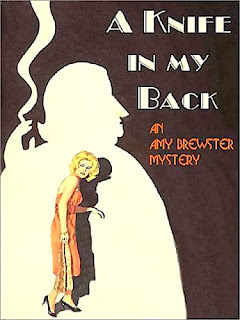 Amy Brewster, the Female Nero Wolfe! "Amy Brewster is a cigar-smoking, 300-pound lawyer-financier introduced by Sam Merwin Jr. in 1945. Upper-class but unfeminine, she is enlisted by friends to solve crimes. 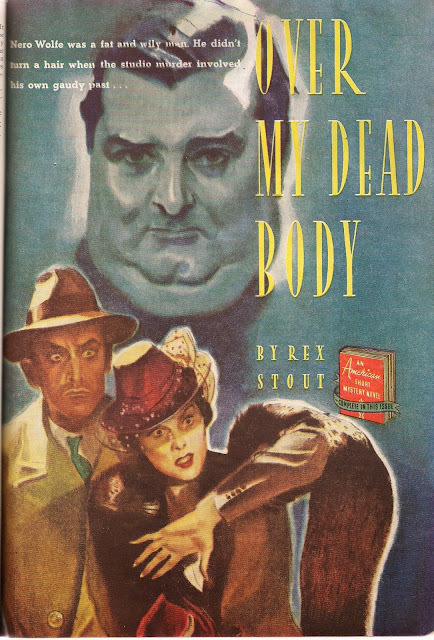 She appears in Knife in My Back (1945), Message from a Corpse (1945) and A Matter of Policy (1946). Both Bertha Cool and Amy Brewster are defined against the genre's stereotypes, particularly the femme fatale: they are not attractive, not home-bound, and not submissive, either conversationally or professionally." -Frances A. DellaCava and Madeline H. Engel, Female Detective in American Novels, A Bibliography and Analysis of Serialized Female Sleuths (1993). Thornton Utz produced covers for The American Magazine, Colliers, and the legendary Saturday Evening Post, until the rise of television after World War II killed the magazine industry and the publications that had been his financial mainstay. Utz is best known, however, as the artist most associated with Nero Wolfe and was said by The American Magazine to have illustrated more Nero Wolfe stories than any other artist. Visitors can see full-sized versions of these and other portraits of the rotund master detective in the Thornton Utz Album at our Deerstalker Facebook page. 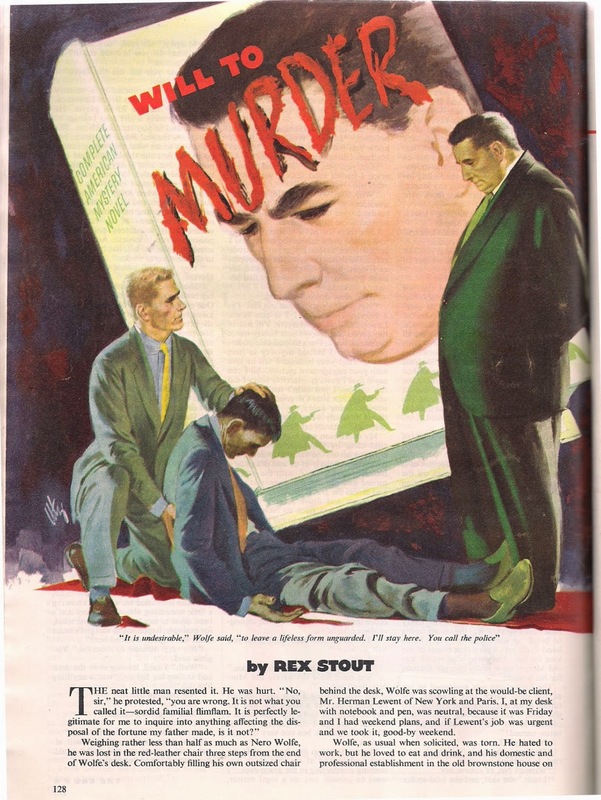 Look for more Utz portraits of Nero Wolfe and portraits by other famous illustrators soon. Plus illustrations of the inimitable Archie Goodwin soon. 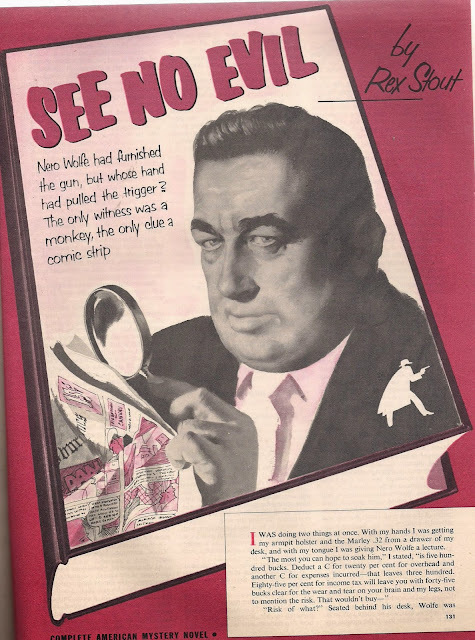 If you love Nero Wolfe, and what right-thinking person doesn't?, you will want to read the adventures of Sam Merwin's rotund, cigar smoking gourmand detective, Amy Brewster, the female Nero Wolfe, reprinted for the first time since the 1940s. Start with A Knife in My Back. Only $3.99 in Kindle at Amazon.